The genus Verticillium is composed of a small group of ascomycete fungi belonging to division Ascomycota. As such, they may also be described as sac fungi. Today, about ten species of this genus have been clearly identified, some of which are phytopathogenic (plant pathogens). The plant-pathogenic species in the genus have been shown to cause damage to a wide variety of crops and can be very costly to control. Along with a number of other species (such as V. albo-atrum), V. dahliae is a soil borne pathogen that is classified under class Deuteromycetes, also referred to as Fungi Imperfecti. It affects and causes wilt in a wide variety of host crops including cotton, potato and fruits like strawberry among others. Apart from barley, studies have shown monocotyledonous plants to be non-hosts, which means that the pathogen rarely affects monocots (plants whose seed in the seed coat contains one embryonic leaf). Because they can be found in many regions across the world (temperate and subtropical zones as well as in some tropic regions) V. dahliae causes significant crop damage globally costing farmers heavy losses. The dormant stage of V. dahliae refers to the phase or extended period of time in which the pathogen remains dormant. During this period, a round, thick-walled structure known as microsclerotia made of melanin allows the fungus (plural fungi) to survive in soil during unfavorable conditions for a period that may range from one year to as long as two decades. During this period, the microsclerotia remains viable and can germinate at any given time when conditions are favorable. 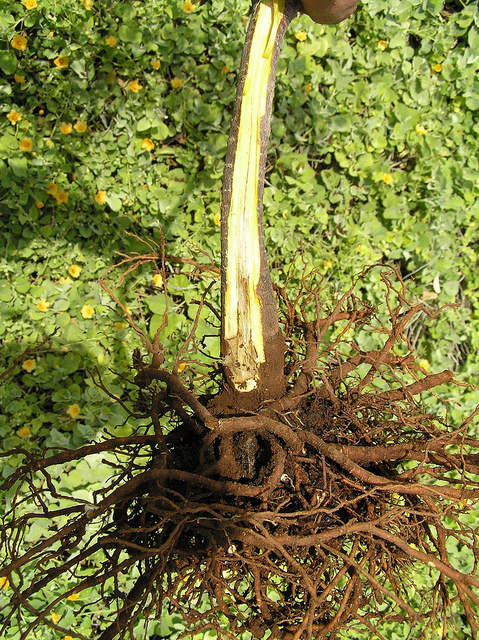 While the mechanism is yet to be clearly understood, the microsclerotia of V. dahliae has been shown to germinate in the presence of root exudates (part of plant defense around the roots) in the rhizosphere of the host plants. As they germinate, the fungi increasingly infects the tips of the roots (of host plants) with varying colonization of the plant cortex from one plant to another. In plants where the fungi has successfully colonized the cortex, they grow into the vascular system where the conidia is formed. This is of great benefit for the fungi given that the vascular system allows the conidia to be transported to other vessels in the plant through the sap stream. In the process, the fungi conidia are transported to other parts of the plant. Studies have also shown the fungi to produce various enzymes (pectinolytic enzymes) that actively cause damage to the parts of the xylem among other sections of the vessels. A glue-like substance is also produced that not only causes the discoloration of the vessels and parenchymal cells of the plant, but also clogs the vessels as they are continuously filled with fungal hyphae. Such toxins as the lipopolysaccharides are also produced which in addition to the other mechanisms, affect photosynthesis and respiration and ultimately result in wilting. This is the parasitic phase/stage. 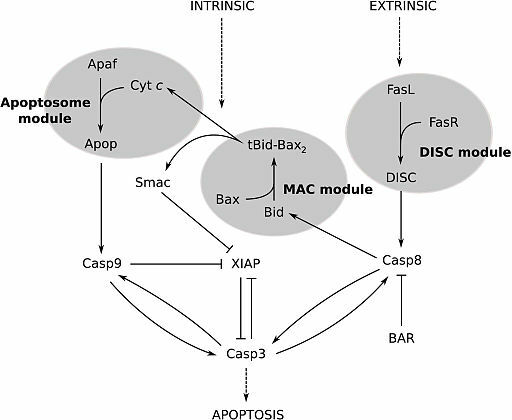 The parasitic phase/stage of the life cycle significantly affects the host plant and enhances its deterioration (senescence). This is followed by the saprophytic stage as the plant deteriorates further and dies. During this phase/stage, the fungi increasingly colonizes various parts of the plant (particularly the roots and shoot) with increased production of the microsclerotia. This stage allows the fungi to continue growing and reproducing as more microsclerotia are produced in the cortex and petioles of the plant. Once the plant completely dies and degrades, the microsclerotia left in the soil can continue with the life cycle when they are stimulated by new root exudates. Verticillium dahliae as well as other species like Verticillium longisporum tend to cause significant crop damage that results in significant losses on the part of farmers. 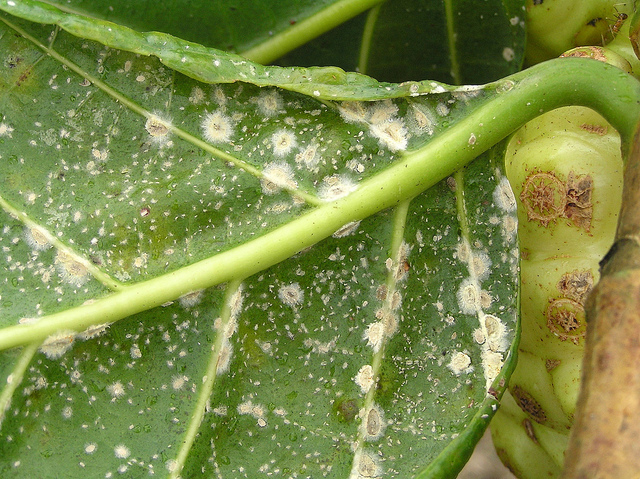 Infection is easily detected through such symptoms as necrosis and tissue death, half-side discoloration of the leaves as well as tissue discoloration. For this reason, many farmers tend to avoid more susceptible plants or control the pathogen through crop rotation. Soil fumigation that was once used to control the pathogen is no longer allowed in mane country due to the negative impacts of the chemical thus the lack of chemical control for the fungus. * While there is no chemical control for the fungus, studies are being conducted to develop the ideal chemical agent that will control the fungus without causing environmental problems/pollution. Unlike V. dahliae, V. lecanii is an entomopathogenic fungus, which means that it acts as a parasite of various insects. V. lecanii has a wide variety of insect hosts that range from aphids, whiteflies and leafhoppers (of sub-order Homoptera) to locusts, crickets and grasshoppers that belong to the order Orthoptera. This is in addition to parasitizing various plant pathogens such as soybean cyst nematodes. Because of their ability to parasitize and even kill these insects, V. lecanii has become one of the most important biological agents used for pest and insect control. * Previously known as Verticillium lecanii Zimm, the fungus is today simply referred to as L. lecanii belonging to the Superkingdom Eukaryota under the Kingdom Fungi. It also falls under Phylum Ascomycota and Family Hypocreaceae. While on this outer protective layer, the conidia starts germinating and forming elongated germ tubes capable of penetrating the hard layer. This is made possible by the secretion of enzymes that enhance the lysis of the epicuticle making it possible for the germ to easily penetrate the covering and continue growing in the host insect. The germ tube then grows into hyphae that continues growing and colonizing the tissues of the insect. As the hyphae grows, it causes the insect to change color, ranging from yellow to red. Ultimately, the insect dies from the pressure caused by hyphal growth within the insect as well as the enzymes secreted. 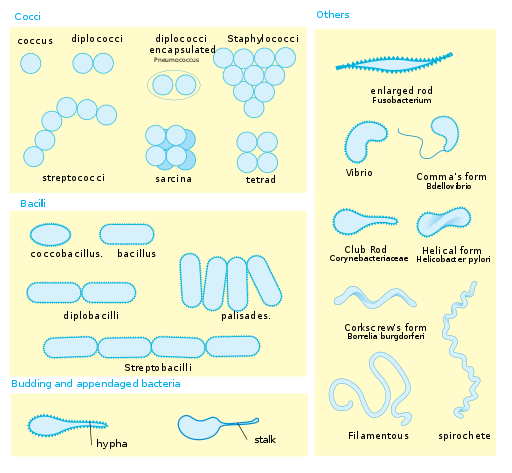 Nutrition from the tissue of the insect allows the hyphae to continue growing and finally differentiate to conidiophores on the surface of the insect that produce conidia. 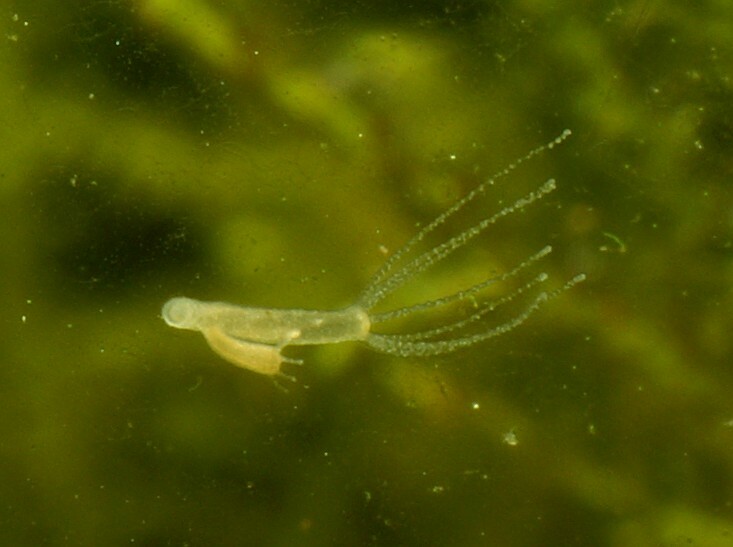 Once the conidia lands on the epicuticle of another host insect, the life cycle begins. Whereas V. dahliae is undesired for its effects on a wide range of crops, the appeal of V. Lecanii lies in the mechanism of its life cycle. As already mentioned, V. Lecanii is an entomopathogenic fungus that grows and reproduces inside an insect and ultimately kills it. This has made it one of the most important fungi used for pest control. While it may be formulated in different ways by different companies, the formulation allows for the spores to remain viable so that they can grow on and kill host pests (aphids, whiteflies etc). For instance, the wettable powder formulation carries viable spores that are capable of penetrating the cuticle of insects such as aphids and killing them in the farm and greenhouses. Before anything, it is always important to ensure that all material used are clean and sterile. This ensures that the culture is not contaminated by other organisms, which can affect the quality of results. For this reason, all material should be sterilized by cleaning and incubating. Place a few pieces of the sample in a jar/container of 1% Clorox for a few seconds - Clorox is a bleach that is used to control bacterial contamination of the sample. To test the effects of the fungus on plants, the roots of a suitable seedling (such as potatoes) can be inoculated/dipped in the conidial suspension from the culture and planted (in a pot, small seedbed etc). After a few weeks, it is possible to see the effects of the fungus on the plant. * Compare the results to the effects described above. Sample - Isolates of the fungi (V. lecanii) may be obtained from infected insects/pests such as aphids and whiteflies. * Make sure to discard used material and samples and clean the work bench using detergents. Also wash hands with soap even if a pair of gloves was used. This helps prevent contamination. The genus Verticillium is made up of a few species of fungi compared to other fungi genus. However, these species infect and affect a variety of host organisms ranging from plants to insects and pests. For this reason, their life cycle and modes of reproduction is dependent on the host organism. While some like Verticillium dahliae are destructive, others like Verticillium lecanii are beneficial and useful in pest control. Abba Muhammad and Raheela Rehman. ISOLATION AND IDENTIFICATION OF VERTICILLIUM DAHLIAE CAUSING WILT ON POTATO IN PAKISTAN. · December 2012. HuismanJ. S. Gerik. Dynamics of Colonization of Plant Roots by VerticilliumDahliae and Other Fungi. 1989. Jan-Kees C. GOUD, And J. TERMORSHUIZEN and Walter GAMs. Morphology of Verticillium dahliae and V. tricorpus on semi-selective media used for the detection of V. dahliae in soil. Mycol. Res. 107 (7): 822–830 (July 2003). M. .J. Jeger. Ecology and Biological Control of Verticillium dahliae. 2000. Shi-Kunne et al., Evolution within the fungal genus Verticillium is characterized by chromosomal rearrangement and gene loss. Environmental Microbiology (2018) 20(4), 1362–1373.